In March 2014, policyholders in 4 out of 6 divisions of Isiolo received payouts of approximately Kenya shillings 404,240. The bulk of the payout went to 10% trigger contract policyholders in Oldonyiro division. 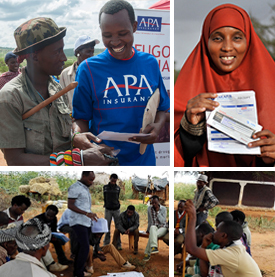 In Marsabit, policyholders received payouts amounting to Kenya shillings 65,940 in North Horr and Loiyangalani. The majority of payouts went to those pastoralists holding 10% trigger contracts in North Horr, as the level of predicted livestock mortality due to drought and severe forage scarcity was not very high.